This location also includes replicas of the Moai Statues from the Easter Islands. Stonehenge II was moved to The Hill Country Arts Foundation in Ingram, TX. HCAF is located just off Junction Highway at 120 Point Theater Rd. South. The map link icon will show you exactly where it is located. The sign at the gate says "The original, located on the Salisbury Plain in England, was built over 3500 years ago. Its purpose is unknown and perhaps unknowable" probably best describes this site located outside Hunt, Texas. Conceived by Al Shepperd and Doug Hill, no one will ever know why this was built. It's beautifully executed in a beautiful meadow. The replica is 60% as tall and 90% as large in circumference as the original. I realize that things in Texas are suppose to be bigger but I'll settle for better. All the stones at Stonehenge II are still standing. 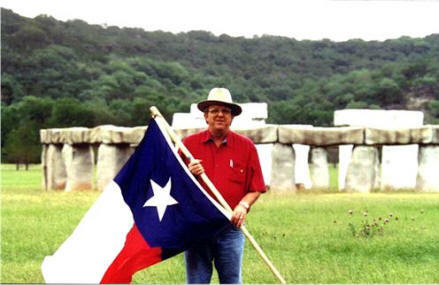 Stonehenge II is located in Ingram, Texas in Kerr County. Take Texas 39 out of Ingram, Texas, to Hunt, Texas, out of Hunt take F.M. 1340. The meadow is on the South side of the highway. The meadow is fenced but has a gate for you to enter and enjoy the sculpture. However, remember this is on private property, please respect it.